In an ever tighter battle between FC Porto and Benfica, there was a lot riding on last night's match. With the two clubs fighting neck and neck for every inch, there was some curiosity as to how they would fare against each other. Every once in a while there's a match that has it all - lots of goals, thrilling action, tactical nuances, uncertainty about the winner. Last night's game was one of those times. The away team twice managed to get ahead, with the hosts immediately getting back on level terms two minutes later. The less than stellar performances from both goalkeepers might have had something to do with it. Apart from the goalies' blunders and the two other goals from set pieces, there weren't that many clear-cut scoring chances - Cardozo's shot against the woodwork a few minutes from the final whistle the clearest of them all. The action-packed midfield area was where most of the game was played and both teams found it hard to find the necessary space and skills to make the key pass. As expected, this was a match with high pressing - even though, oddly enough, FC Porto were the ones pressing higher and more effectively. In fact, the Dragon's extra man in midfield (Fernando and, most often, Defour) was decisive in bypassing Benfica's timid pressing. In fact, the Belgian midfielder was crucial for the northerners' supremacy in midfield, often appearing in areas usually not recommended for a (albeit nominal) right-winger. While Matic kept a close eye on Lucho González, Enzo Pérez played high up to stop João Moutinho from starting the attacks - as he usually does - and therefore disturb FC Porto's passing rhythm. However, Lima seldom managed to get goalside of Fernando and the Brazilian holding midfielder often acted as a destination for his team's one-twos. Benfica, in turn, found it quite hard to play out from the back, with Jackson Martínez often marking one centre-back and Lucho leading his side's pressing, running towards the goalkeeper and/or the remaining centre-back. With that approach, Vítor Pereira's charges were attempting to stop Benfica from having the time to take the best option to overload the wings and attacking in numbers, as they so often do. Under such pressure, Jorge Jesus' men were often forced to resort to long balls, where Cardozo was often overcome by Otamendi and Mangala. During the first half, FC Porto were better at pressing and circulating the ball, while Benfica looked most dangerous when the ball got to the wings (particularly the right one). Despite their good defensive record thus far, the Portuguese champions didn't always look comfortable when dealing with Sálvio's penetrations. On the other hand, they found it very easy to attack their opponent via the centre - with Matic and Enzo Pérez drawn towards Lucho and Moutinho, Jackson and Defour found themselves in good positions to escape their markers. FC Porto would end the first half with a staggering 57% of ball possession. The first 15 minutes of the second period were not dissimilar to the first half. 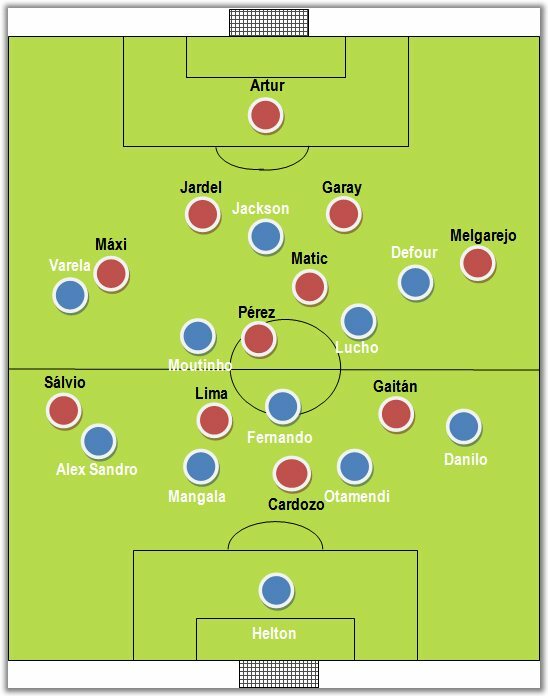 Benfica were still struggling to play the ball on the ground - often giving away the ball too cheaply - and FC Porto kept their good pressing approach, even though Lucho kept dropping further back. However, with the removal of Enzo Pérez for Carlos Martins, Benfica became more competitive, while FC Porto started to tire out (the squad's lack of depth became all too evident, Izmailov being the first substitute, 75 minutes in) and were no longer able to maintain their pressing. After Aimar came on a few minutes later for Lima (perhaps the night's biggest disappointment), the Eagles gradually found their stride and became more of a nuisance for FC Porto's back four. With his team incapable of pressing as high and as much, Vítor Pereira happy with the result and less willing to take risks, instructing his team to drop back Buoyed by Martins' gritting approach and Aimar's better movement, Benfica ended the match on a better note than they had started - and could have even won the match, had Cardozo managed to bury the game's best scoring chance apart from the goals. In the end, the ball possession statistics was halved to perfection: 50% to each team. Even though such individuals honours are not usually awarded on this blog, there are two players worth setting aside for their brilliance and hard work. On one hand, Matic was critical on every aspect of Benfica's match. Besides keeping Lucho González on a short leash, not only was the Serb beyond reproach in covering for this team-mates, he also insisted on making himself available for a pass and kept finding boulevards for other players to run into. On the other hand, Defour might have come out of the game virtually unnoticed, but his combativeness and perennial movement led to FC Porto's supremacy in midfield - and ultimately to his exhaustion.